Fourth of July is upon us, which is hard to believe considering the late start to summer. The Fourth happens to be one of my favorite holidays. I love the parades, festivals, fireworks and bbq's, it really is the best part of summer. This year I've found myself the perfect fireworks snack, or really any time snack. 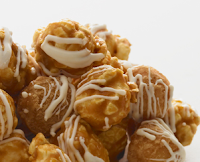 Popcornopolis is made using only the freshest, all natural ingredients. They guarantee their popcorn is "the hallmark of quality from the first bite, to the bottom of the tin.." and I have to say, the popcorn is pretty incredible. It tops the list of any specialty popcorn I've ever had, and I'm a huge popcorn lover. 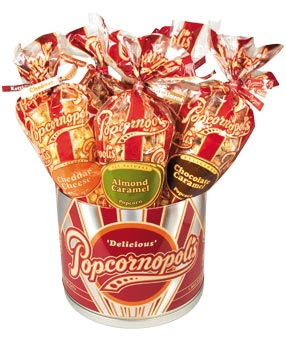 So, this year, watch the fireworks and keep your mouth happy with your own batch of popcornopolis. Available in multiple mouthwatering flavors. These are so yummy. I've bought them at Costco before. 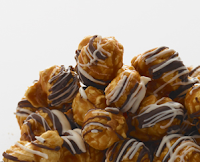 The Zebra popcorn is my favorite, which has dark and white chocolate drizzled on the caramel corn.